Home / International / News / Politics / Int'l political commentator slams Trillanes: "Stop pretending you are clean, your hands are very dirty"
Assadollahi expressed his disgust on Trillanes, saying that there is no significant thing the senator except for switching off somebody else’s microphone and joining the infamous failed Oakwood Mutiny. He also stated that Trillanes was associated with the group that steals public money. He further describes Trillanes as double faced person that switches on different sides that will give him protection and benefit. He warned Trillanes because the charges put up to Senator De lima might be linked to him. “I am so interested to find out the relation between you and your corrupt and criminal friends to lawlessness acts in the Philippines, the money trails, the weapon trails, the drug trail, and let’s not forget certain terror acts,” said Assadollahi but he cleared out that he’s not implying anything but it pays to trace the aforementioned incidents to see where this leads. 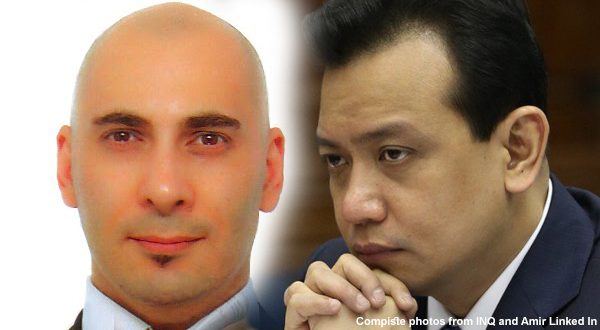 Assadollahi warned Trillanes to ‘come clean’ and stop his babbling against the President. He said that Trillanes may see himself as a big fish but Assadollahi powerfully says that he’s just an errand boy doing all the dirty works for the ‘bosses’. His loyalty was for the few who gave him some benefit and in return he has to do everything they say. He compared Trillanes to a canine that can be pleased with just a big bone and be delighted with a simple belly scratch. Assadollahi said that Trillanes’ career and personal life resume is full of ‘stinky things’. He further advised the senator to help the Philippines to attain peace and order. "You are not that important person, but your hands are very dirty." Senator Trillanes was just pone in the battle of Kings, but his he was handful of dirty business and crimes. Assadollahi said that what Trillanes together with the corrupt parties, with the help of the oligarchs and media is making a bad reputation for the Philippines in the global setting. Assadollahi thought that Trillanes recklessly left the trail, making him to be a suspicious individual who was allegedly having a participation in corrupt practices and involved in lawlessness plot. Assadollahi stated that there were ‘trails’ that Trillanes left for him to be linked with the lawlessness, murder and the missing weapons. He advised Trillanes to stop those make-believe tactics he has. It seemed that Trillanes was so busy to destabilize the President not minding to clear his own trail, leaving no evidences so that he may claim that he’s clean, after all. You know, you switch masks very quickly, very similar to Madam Senator De Lima, and she was not able to hide the truth and now behind the bars for her connection to illegal drugs money and soon other charges will surface that would link you and few others to her and other crimes and corruptions, and you all can join together waiting for your "final judgment", and no, I am not talking about the video game fantasy quest in "Dragon's Dogma"! I am talking about when the Filipinos and the rest of the world will reach to a common agreement to judge you and your friends. judge and talk!? ... LOL ... I said the same things to Madam Senator De Lima and requested her to come clean and stop her B.S., and I am advising you the same. You may think you are a big fish, but just an errand boy that is following the orders you are have given, just like any foot-soldier follows its superiors' orders. Definitely your loyalty is not to your actual superiors, the Filipinos, who had hired you to represent them, but to others who give you a bone to chew on and bark when they tell you to and role over when they want to scratch your belly. After all you have a history of treason and failed attempts to take over the country with some kind mistaken self belief that Filipinos actually liked you or believed you. Now, that you are in frustration that you could be found and linked to many crimes, you are creating your own TV drama - "Trillanes on the Run", and it is almost like a Mafia crime comedy TV series, and you are one of the players that looks like the main character but actually near the end of the series we see that there are bigger bosses that pull the strings. You see, your career and personal life resume is so thick filled with things that stink so badly that no matter how much perfume you put on it, it will still stink. Just come clean and help your country to develop the peace and security it needs to have to fight the terrorists and foriegn contra affair agencies' plots and ploys. You are not that important person, but your hands are vey dirty. What you have been keep doing with your other corrupt and criminal political and business oligarch friends and the media they own is wrong and is keep hurting the Philippines in the eyes of global society who don't know much about you and your friends' involvement and hands in all the mess you all have created for decades in the Philippines. You are going to lose everything you have been stealing, and there will be a link between you and the lawlessness we see in the Philippines as well as the drugs money trails that will lead to weapons and murders. How do I know that?! Well, you left a trail of breadcrumbs right behind you and birds are feeding of it, and your footsteps left an impression on the mud behind you, and you thought you washed up the dirt off your shoes and pants, but forgot to clean your hands and smudges it all over your closed and everything you touched, leaving many fingerprints on clear surfaces behind you, thinking that you only had to wash your pants and clean your shoes, just not knowing that the fat sandwich you were eating while walking was leaving behind a long trail of breadcrumbs and birds are eating off of it, and the hunters have smelled the trail and been after you. So, stop pretending that you are clean, because you are certainly not, and everyone can see the dirt on you that you carelessly put on yourself. Then again, who am I to talk, I am just a Canadian political scientist who have been intrigued by the mess you and your colleges have created, and can see your games.